Copyright: Albert Roura. PDF: 11 MB. Copyright: Alex Cronin. PDF: 7.4 MB. Copyright: Benjamin McMorran. PDF: 31.5 MB. Copyright: Dennis Schlippert. PDF: 4 MB. Copyright: Dmitry A. Pushin. PDF: 5 MB. Copyright: Hartmut Abele. PDF: 13.8 MB. Copyright: Helmut Rauch. PDF: 5 MB. Copyright: Markus Arndt. PDF: 4.3 MB. Copyright: Stephan Sponar. PDF: 81 MB. Copyright: Valery Nesvizhevsky. PDF: 3.4 MB. Copyright: Yuji Hasegawa. PDF: 8.8 MB. Creative Commons Attribution - ­Noncommercial issued by Tim Kovachy. PDF: 8 MB. Creative Commons License granted by Justin Khoury. PDF: 22 MB. Work of U.S. Government not subject to copyright. PDF: 4 MB. 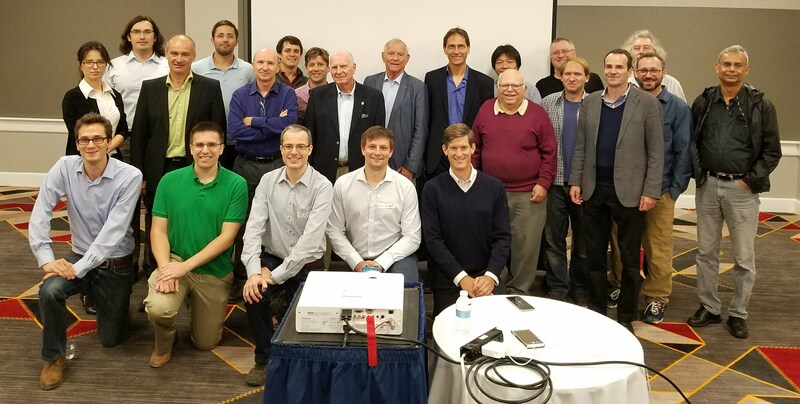 The Joint Quantum Institute sponsored an informal workshop on matter-wave interferometry, September 30-October 2, 2016 in College Park, Maryland. Participants from left: Stephen Eckel, Maria Solyanik, Dmitry Pushin, Valery Nesvizhevsky, Tim Kovachy, Dusan Sarenac, Andrei Afasanev, Benjamin Heacock, Albert Roura, Benjamin McMorran, Samuel Werner, Dennis Schlippert, Helmut Rauch, Markus Arndt, Alex Cronin, Danny Greenberger, Yuji Hasegawa, Charles Clark, Stephan Sponar, Hartmut Abele, David Cory, Michael Huber and Muhammad Arif. Other participants not seen here: O. W. Greenberg, Shannon Hoogerheide, Bei-Lok Hu, Avinash Kumar, Chandra Shahi. This site contains a record of the presentations, as they have been provided to us by the original authors. Spatial resolution measurements of the Schrödinger wave-function of the quantum bouncing ball and precision measurements with "Gravity Resonance Spectroscopy". Matter-wave interference has recently been extended to clusters and molecules, showing quantum delocalization of individual particles even as massive as 10,000 proton masses. These experiments explore the subtle interface between quantum phenomena and classical observations, which may eventually be defined by the interface to gravity physics or biology. In addition, molecular matter-wave interferometers are now also becoming tools for sensitive measurements in biomolecular physics and physical chemistry. We report analyses of orbital angular momentum and spin-orbit-coupled states of neutrons, and their potential application to studies of chiral materials. We also discuss recent phase-grating experiments. Cronin, Alex: Atom Interferometry: "Swiss Army Knife of Physics"
Measurements of polarizability made with atom interferometry were used for more accurate determination of the lifetimes of excited states of rubidium and cesium. Matter wave interferometers that cover macroscopic scales in space and in time have a high intrinsic sensitivity to inertial forces, making them a promising candidate for a wide range of precision measurement applications. We show how to overcome the technical barriers to the experimental realization of these interferometers, and we demonstrate the application of these interferometers to precision gravity gradiometry and to dual species acceleration measurements for a test of the equivalence principle. We have shown that nanofabricated diffraction holograms can be used to sculpt the wavefunction of a free electron. For example, we demonstrated that nanoscale patterns with engineered defects can be used to produce electrons with helical shapes which carry quantized orbital angular momentum. The orbital angular momentum is a new degree of freedom for free electrons, and our lab is devising ways to use this for new types of electron microscopy. In addition to creating electrons with orbital angular momentum, we have also designed several new ways to measure it in free electrons. The accuracy of measurements of neutron whispering gallery effect has been dramatically improved in recent experiments; these results will allow better constraining short-range forces. We review progress in preparation and detection of orbital-angular-momentum (OAM) states of neutrons, and demonstrate holography of macroscopic objects in a neutron interferometer. The neutron hologram of a spiral phase plate is found to have the same pattern as a forked dislocation grating. Rauch, Helmut: How wave packets are shaped and how they interact? Very long baseline atom interferometry (VLBAI) promises to provide an excellent testbed for tests of fundamental physics, e.g. testing the universality of free fall. Here we show recent progress of the Rb-Yb-VLBAI facility in the new HITec building in Hannover, Germany. The edible edition of Neutron Interferometry. Sam Werner cuts a piece of the cake for Helmut Rauch. L/R: Charles Clark, Hartmut Abele, Danny Greenberger, Helmut Rauch, Sam Werner, Andrei Afanasev, Maria Solyanik, Steve Eckel and Valery Nesvizhevsky.